Ticket includes a gourmet two-course Christmas feast by MasterChef winner Natalie Coleman. MasterChef winner Natalie Coleman is cooking up a storm nightly at Scrooge's Parlour in the beating heart of Liverpool Street, for A Christmas Carol, London's newest immersive dining experience. You are cordially invited to the parlour of Mr Ebeneezer Scrooge for a rousing rendition of this timeless classic. Through parlour games, festive songs and a little spirited trickery, we must warm the heart of the bah-humbugging miser. A show about Christmas spirit, caring for those we love, and having a good old-fashioned knees-up couldn’t be a more perfect way to warm a cold winter’s evening. 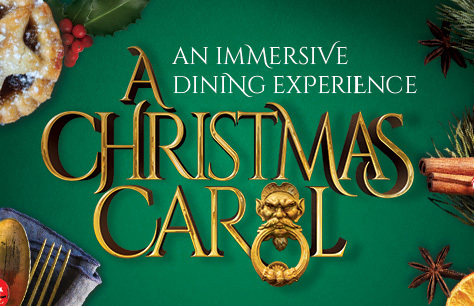 Told over a truly magical Christmas feast and a fully stocked bar, this heart-warming and beautiful immersive theatre show is perfect for first dates, Christmas parties, and cheering up the family Scrooge! The Flanagan Collective (Immersive Great Gatsby, Beulah) brings this seasonal show to life for its fifth consecutive year. We have teamed up with Hackney Girl Cooks own Natalie Coleman and the Olivier Award-winning producers (and good friends) Louis Hartshorn and Brian Hook (Madagascar, Rotterdam, Woody Sez, American Idiot) to bring the show to the beating heart of London. Main - Roast turkey with pigs in blankets, roast potatoes, honey roasted parsnips and carrot, spice red cabbage, pork, sage and onion stuffing and Brussels sprouts. Vegetarian option - Chestnut and mushroom parcels, white wine and tarragon sauce, roast potatoes, honey roasted parsnips and carrots and spiced red cabbage and Brussels sprouts. Please email any dietary requirements to olivia@hartshornhook.com once you have purchased tickets. Please note that latecomers will only be admitted at the discretion of event management staff and at an appropriate interval. Once you have purchased tickets, please contact olivia@hartshornhook.com with any dietary restrictions/allergies.